Happy easter to all my lovely blog readers and friends. We had already a lot of fun with the kids looking for chocolate bunnies and little presents in the garden. It is such a magical time when children are still young and believe in things like the easter bunny, Santa Clause or the tooth fairy. I enjoy such moments immensely. Today's challenge at the High Hopes blog is "Pierce it!" Little Showgirl is coloured with water soluble pens and Twinkling H2Os. I cut her out with Spellbinders new Labels 4 Nestabilities and did some faux stitching around her. 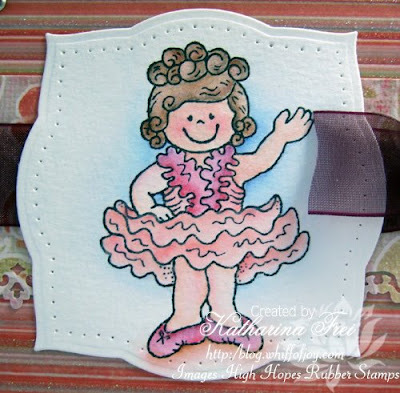 I used my Fiskars lace border punch again and did some paper piercing on the pink cardstock. All papers are from My Mind's eye (I soooo love the Laundry collection, all the glitter and the heavy quality). Das Thema dieser Woche auf dem High Hopes blog is "Paper Piercing, also das Papier mit einer Nadel zu bearbeiten". 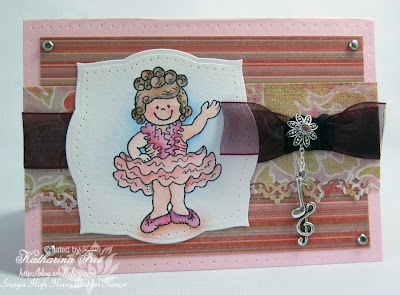 Das kleine Showgirl habe ich mit Aquarellstiften und Twinkling H2Os coloriert und dann mit Spellbinders neuen Labels 4 Nestabilities ausgestanzt. Runherum habe ich dann mit meiner Nadel den Rand nachgestochen. Ich habe auch meinen Fiskars lace border punch wieder verwendet und auch noch rund um den rosa cardstock paper piercing gemacht. Alle Motivpapiere sind von My Mind's Eye, aus der Laundry Line Collection (dieses Papier ist einfach sensationell, all der Glitzer und die dicke Qualität). The embellishment inside the bow and the charm chain was send to me by my dear friend and WoJ DT Bev (together with a lot of other goodies :) Thanks Bev, you are the best! Bev also provided a tutorial on her blog about how she attatches charms with jump rings and chain, which was very helpful for me, maybe you want to check it out. Enjoy your easter holiday and thanks for stopping by! Ich wünsche euch einen schönen Ostersonntag und danke euch fürs Reinschaun! Oh your card is just beautiful dear as always. Oh I bet the children were having a ball, brings back memories doesn't it. Sounds like your little ones have enjoyed their easter so far.. love the card that you have made it looks really sweet with the dangly charms..
What a gorgeous card! 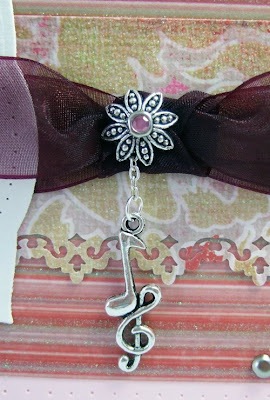 I just love that charm! I love this image and your coloring is just beautiful. An adorable card Katharina! Love it! Happy Easter! Beautifully coloured and such fabulous paper and detail! wowwww Katharina,what a beautiful card,l love the stamp and colour. Absolutely beautiful card! The charm is perfect for the image! I can almost hear the circus band playing!! Beautiful Katharina! Such soft feminine colors, and elegant ribbon. I love the charms. What a pretty layout for this stamp. Awesome coloring as usual! Gorgeous! Katharina, thank you for joining us at Creative Inspirations this week. Your card is wonderful, the papers are gorgeous as well as the image which is coloured perfectly. I adore the charm you have added also.